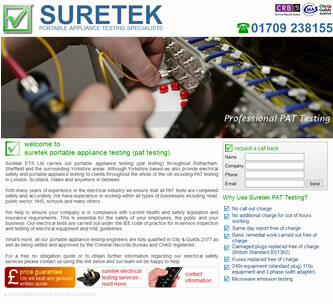 Coverage: Suretek ETS Ltd carries out portable appliance testing (pat testing) throughout Rotherham, Sheffield and the surrounding Yorkshire areas. Specification: Suretek required a simple website presence to back up their existing literature and marketing. The website also features a client login area where PAT reports can be accessed and which is updated by Sleepy Frog Designs as required.